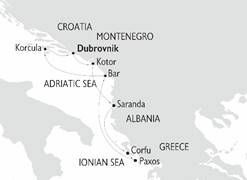 Two different cruise voyages unraveling the natural and ancient wonders of Dalmatia and Montenegro, or the secrets of 4 different countries in 8 days. The Callisto is a 52 m /170 ft Motor Yacht which complies with the latest SOLAS regulations for International Voyages. Her state of the art twin stabilizers allow for safe and comfortable cruising. Elegant, classic. She was fully refit / rebuilt in 2000 and was thoroughly renovated in 2015-16.
of the “boutique” category of cruiser, and offers the highest standard of accommodation, comfort and safety. The Callisto offers 17 finely appointed exterior cabins located on the Lower deck and the Main deck. All cabins are comfortably arranged and beautifully furnished with wooden furniture and light fabrics. They all have marble-appointed en suite bathrooms with showers and are equipped with windows (Main deck cabins) and portholes (Lower deck cabins). All cabins have individually controlled A/C and fitted with flat-screen TV, telephone (for internal use), hairdryers, mini-fridge, central music, public address system and safe boxes. 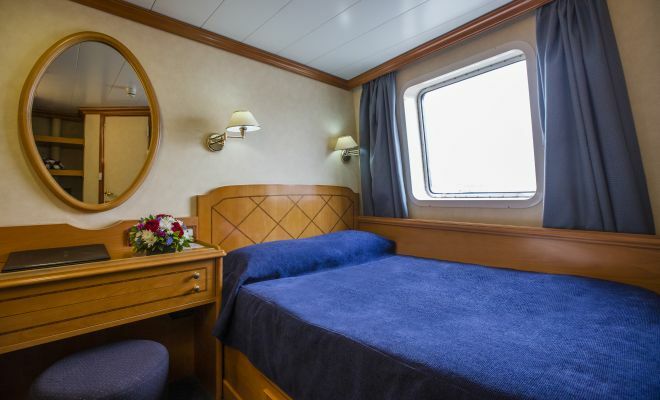 Four Main deck cabins –bow section- offer 1 double bed while all other cabins in the Lower and Main decks are equipped with twin beds. The lounge/bar and dining room on the Upper deck are connected by the gallery, displaying exquisite art and adding to the overall feeling of elegance and style. In the evening you can relax in the ship’s lounge, enjoy a drink overlooking the stars or relax with a book in the library with its wraparound windows. The spacious lounge and bar area on the Upper Deck is surrounded by large picture windows and opens onto the Outdoor Dining area. Located on the Upper deck, the dining room seats all passengers in a single, unassigned seating and allows for spectacular views around, while dining in an elegant environment. 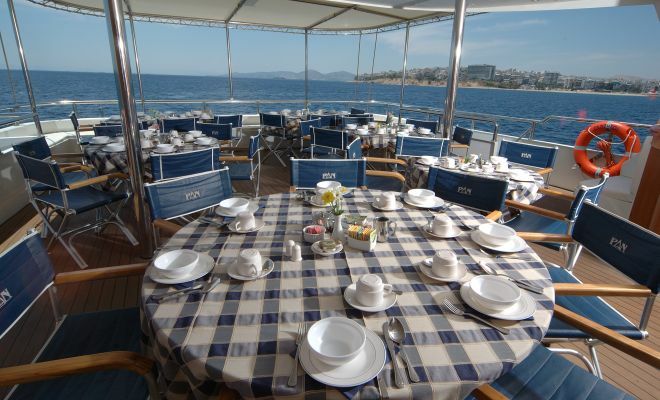 Meals can be also served “al fresco” on the Upper Deck’s outdoor Deck, depending on weather conditions. Food is served at the table or displayed on the state of the art hot & cold buffet which also includes an “a la minute cooking” section. The yacht features a broad Sun Deck for sunbathing and the swimming platform on Callisto’s stern enables you to swim off the ship when in sheltered bays. Sun loungers are available to sunbathe in total comfort. In the evening you can relax in the ship’s lounge, enjoy a drink overlooking the stars or relax with a book in the library with its wraparound windows. Friday DUBROVNIK-CROATIA Embarkation between 3 pm and 4 pm. Welcome dinner and evening sailing to Split, Croatia. Overnight at sea. CROATIA Arrive in Split in the morning. Croatia. Enjoy a morning optional walking tour to discover the city of Split, the former Imperial Resident of Roman Emperor Diocletian, dating back from the 4th century. After lunch on board, enjoy one more optional afternoon excursion to nearby Trogir, starting with a scenic journey along the Dalmatian Coast to this coastal tow. Late afternoon sailing to Rab. croatia Morning arrival in Rab. Enjoy a morning optional walking tour of Rab, a historic town of rare charm founded in Roman times along a narrow tongue of land, so when travelers approached from the sea, they could see it proudly atop the head of the bay. Discover cultural and historical monuments including the Church of Justina, the Church of St. John the Baptist, the Prince’s Palace. 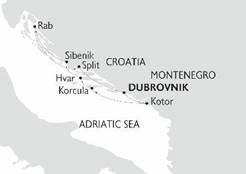 Later in the afternoon, we sail south passing between the beautiful Kornati Islands to reach Sibenik. Overnight at sea. Day 4 – Monday sibenik, CROATIA ☽ We reach Sibenik through a spectacular fjord. Our optional all day excursion will take us to the Krka National Park home to abundant indigenous flora and fauna, including over 200 bird species, before exploring the seaside city of Primosten and Sibenik old Town. Overnight in port. CROATIA☽ Early morning sailing and arrival in Hvar, the longest of the Croatian isles. Enjoy a morning optional walking tour to discover the island’s Venetian flavor. You'll discover a fascinating array of sights, including the Cathedral of St. Stephens with its treasury and bell tower, or the Arsenal, built in 1611 and housing Europe's oldest theater. Early afternoon enjoy a relaxing swim and sail to Korcula. Late evening arrival in Korcula and overnight in port. CROATIA Enjoy all day optional excursions in Korcula Town and to Lumbarda Village for wine tasting Guests will have the opportunity to drive and stroll through Milina - Bire family vineyards before reaching their house. Evening sailing and overnight at sea to the coastal town of Kotor in Montenegro. CROATIA ☽ Early morning navigation in Kotor, the deepest natural fjord in the Mediterranean. 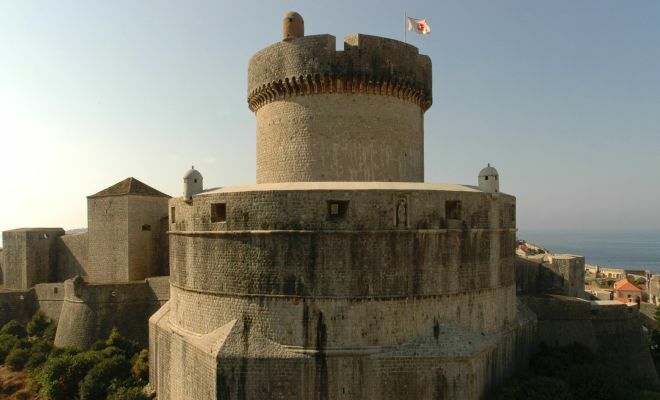 Join the optional morning excursion to the well-preserved, fortified medieval Old Town, featuring stunning fortifications including the 10th century city walls, the Baroque church of St Blaise. 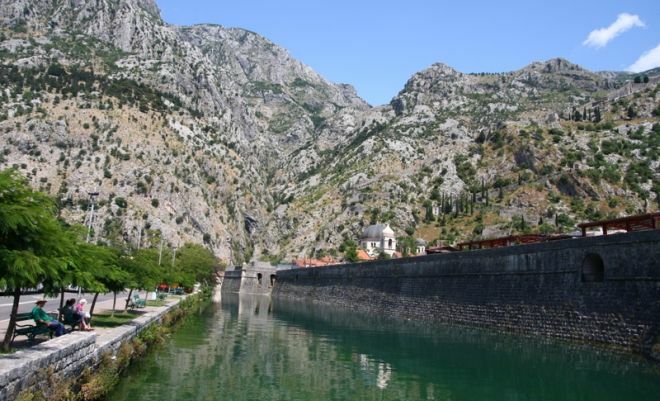 We leave Kotor after lunch and sail through the stunning fjord of Kotor Bay. Late evening arrival in Dubrovnik- Overnight in port. CROATIA Disembarkation at 9 am after breakfast. Friday DUBROVNIK-CROATIA☽ Embarkation between 3 pm and 4 pm. Welcome dinner – Overnight in port. CROATIA Early in the morning sailing to Korcula, Croatia. Enjoy a refreshing morning swim stop near Korcula* before arriving at Korcula port in the afternoon. 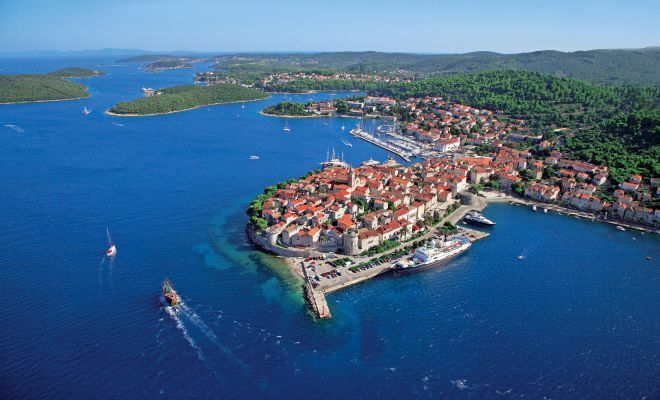 Afternoon optional excursion in Korcula Town or in Korcula Town and to LUMBARDA Village for wine tasting. Overnight at sea to Bar, Montenegro. MONTENEGRO Morning arrival at Bar, a small coastal town of Montenegro. Morning optional sightseeing excursion to Old Budva. Explore Budva’s vast cultural heritage and Venetian architecture. Overnight at sea to Paxi, Greece. GREECE☽ Short stop in Corfu for clearance and continue to Paxos. Sail into a nearby bay for a refreshing swim stop and a BBQ lunch on board. This afternoon arrive in the unique port of Paxos. Overnight in port. 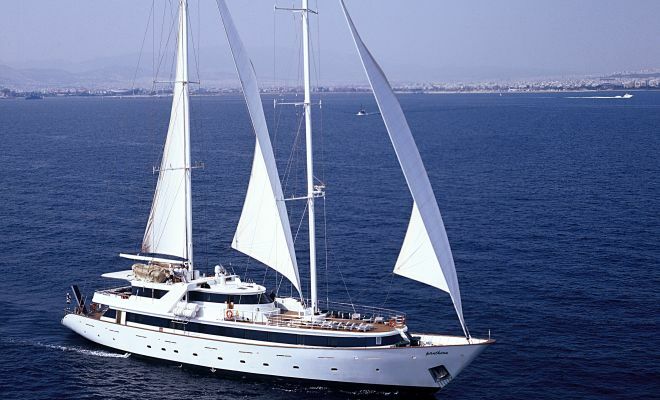 GREECE☽ Early morning sailing to Corfu, the Grand Lady of the Ionian Islands and the greenest island in Greece. 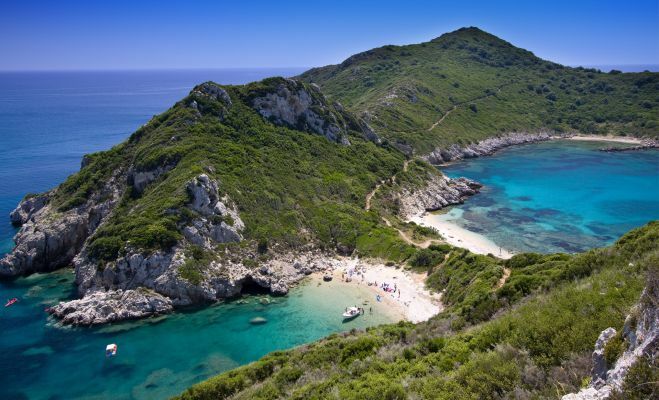 All day optional excursions to explore Corfu’s imperial past, the impressive historic centre declared UNESCO World Heritage site and the byzantine churches, or to take a scenic tour through the lush Corfiot countryside and old high hill villages. Overnight in port. GREECE – SARANDA ALBANIA Early morning sailing to the charming town of Saranda, boasting the most attractive waterfront on the Albanian Riviera. Join the optional excursion to the nearby archaeological site of Butrint or enjoy an afternoon relaxing swim. Afternoon sailing to Kotor, Montenegro. Overnight at sea. montenegro☽ Early morning navigation in the Bay of Kotor, the deepest natural fjord in the Mediterranean. 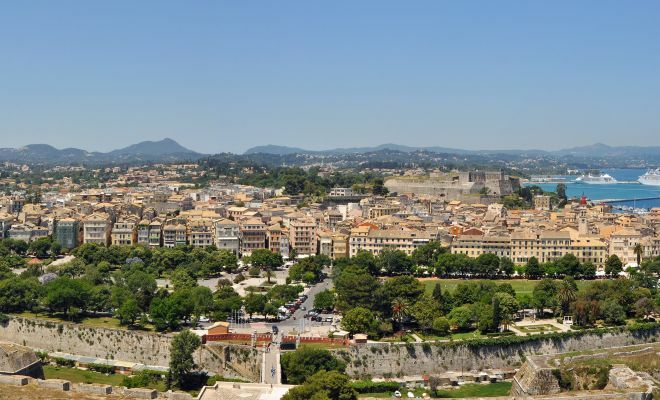 Join the optional excursion to the well-preserved, fortified medieval Old Town. Late night sailing towards Dubrovnik, Croatia. CROATIA Arrival and disembarkation after breakfast at 8:00-9:00 am. Itineraries can be changed at the discretion of the Cruise company and of the Vessel's Captain in case of adverse weather conditions - winds of 6/7 beaufort or more depending on the vessel- on port authorities not allowing a vessel to leave port or in case of other extraordinary conditions. Such itinerary changes do not entitle automatically passengers to any refunds but Variety Cruises guarantees that passengers are disembarked at the advertised port of disembarkation on time for their flights.